Test includes 2 folding boards, 60 blocks, carrying case, and instruction manual. WHO USES THE COMPLETE MINNESOTA MANUAL DEXTERITY TEST? 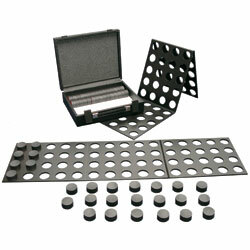 The Complete Minnesota Manual Dexterity Test can be used for many testing applications. Physical Therapy, Occupational Therapy, vocational evaluation, and pre-employment screening are four generalized uses of the Complete Minnesota Manual Dexterity Test. Other applications for the Complete Minnesota Manual Dexterity Test can be found by doing a bibliography search. Physical and Occupational Therapists use the Complete Minnesota Manual Dexterity Test for injury rehabilitation. The Complete Minnesota Manual Dexterity Test is a tool used to obtain baseline data on a patient. This test can also be used to document patient progress and / or degree of disability. Vocational evaluators use the Complete Minnesota Manual Dexterity Test to determine a subject’s ability and aptitude for certain work related applications and for recommending job placement that requires manual dexterity. The Complete Minnesota Manual Dexterity Test is also used to develop a specific training program that will give an individual the skills to complete a job task that requires manual dexterity. Human Resource Directors and Temporary Staffing Agencies use the Complete Minnesota Manual Dexterity Test as a pre-employment screening and selection tool. An applicant’s performance on the Complete Minnesota Manual Dexterity Test can indicate their ability to perform in a job / task that requires manual dexterity.